Hot diggity dog—but in a totally spiritual way—no halfway measures for Brother Matthew! Did you catch that? Included among the seismic prodigies that accompanied Jesus’ final moments on Friday, the tombs opened up and “the bodies of many holy people who had died were raised” BUT they obligingly just hang out in their tombs until Sunday, “after his resurrection,” before walking into Jerusalem where they “were seen by many.” Oddly enough, this electrifying turn of events, complete with holy zombies, is unmentioned in the other gospels or in any histories of the era. If you have questions, that’s understandable. For starters, if a hoard of dead men walking proved Jesus had risen, why didn’t Jesus His Own Damn Self just show up in Jerusalem? What could have been more convincing than Jesus Himself back from the dead, clothed in glowing raiment, appearing to the Jewish and Roman leaders? After all, when the high priest asked Jesus, “Are you the Christ, the son of the Blessed One?” didn’t Jesus tell the court, “I am! And you will see the son of man seated at the right hand of power and coming with the clouds of heaven!” (Mark 14:61-62) Whatever happened to that I’ll-show- you-and-then-you’ll-be-sorry blow and jive from Jesus’ trial? Somehow, even when Jesus Himself does appear, believers initially mistake him for someone else! Coming from the tomb, Mary Magdalene thinks he’s the gardener (John 20:14-15), Peter and his buddies don’t recognize him at first in Galilee (John 21:1-13), and the disciples on the road to Emmaus think he’s another traveler. (Luke 22:13-21) And when Jesus Himself appears on a hill in Galilee to give his eleven remaining apostles their mission to convert the world, we’re told, “when they saw him, they fell to their knees before him, but some doubted.” (Matthew 28:17) If you don’t think the “but some doubted” part still has Christian heads spinning like tops, just Google it—you’ll get around 20,000,000 hits, which seems like a lot of reassurance over something Christians are supposed to be absolutely sure about. Pilate told them, “Take a guard and go make the tomb as secure as you know how.” So they left and secured the tomb by sealing the stone and posting a guard. If a hoard of dead men walking proved Jesus had risen, why didn’t Jesus His Own Damn Self just show up in Jerusalem? There is a least one glaring problem with this narrative: Matthew has already established that the stone covering the entrance to the tomb was so heavy it required an angel to move it. So how did the soldiers manage to stay asleep while a gaggle of Galilean hillbillies broke into the tomb in the dead of night, removed seals from the stone, rolled it aside, and then made off with the corpse the soldiers were guarding, all without awakening a single soldier? A second problem that would have occurred to any literate reader in the Roman era concerns the identity of the soldiers. Although the Temple had a police force, the force described by Matthew was reportedly under the command of Pilate, the governor. 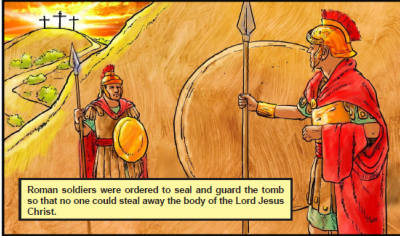 The soldiers—the gospel uses stratiōtēs, the usual Greek term for “soldier”—form a picket, a guard placed around the tomb. The gospel uses a Greek loanword, koustōdia, from the Latin custodia, meaning in this context a military guard, and since the term is derived from Latin, logically a Roman military guard. Would a Roman military detachment really have reported back to Jewish priests? What fate would have awaited a Roman soldier who reported to his commander that he’d been asleep on watch? Recall that the Roman army practiced “decimation” as a punishment for insubordination or other failures of duty—his fellow soldiers killed every tenth man in a unit selected for the punishment of decimation. Given the stringent discipline of Roman forces, stationed in a hostile province, what are the odds a detachment of Roman soldiers would lie to their commanding officer, and by extension to the governor of the province, in return for a bribe, particularly if discovery would result in execution? Clearly, as Roman critics of Christianity were quick to point out, the gospels were written for the edification of pious yokels eager to be titillated by celestial fairy tales. In the next installment we’ll watch as the resurrection accounts literally become ghost stories.